Our handmade Yoshihiro Mizu Yaki Blue Steel Kurouchi Sujihiki Slicer knives are at the top of its class in performance. Mizu Yaki is a meticulous process of pure water quenching that draws out the hardness of refined steel while infusing enough resiliency to perform consistently in the most exacting of conditions. 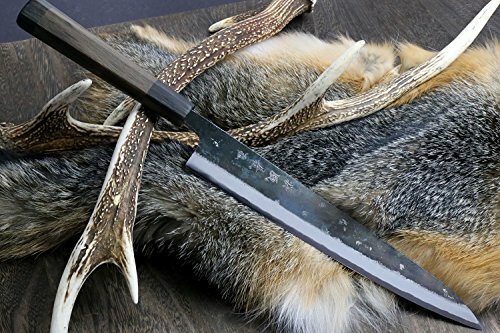 Exemplifying the most intricate techniques of forging, layering, and hammering, Kurouchi translates as Black Forged and is a traditional Japanese method of crafting high carbon knives. This unique style of forging offers an unpolished rustic finish. With a hardness on the Rockwell scale of 62-63, the inner core of Blue Steel #2 is prized for its high edge retention.